“And hate speech can lead to hate crimes,” Blumenthal said. And while Blumenthal is not facing re-election on Tuesday, he was speaking to some students who are old enough to cast a vote in the election. Breitbart News contacted the Manchester School Board to ask a series of questions about Blumenthal’s “town hall,” including whether or not someone with a conservative worldview would be invited to speak to students. Breitbart News also asked if parents were involved in giving their children permission to miss class to attend a partisan political event and if students were allowed to opt-out. Jim Farrell, attendance and communication director and safe school climate coordinator for the district, emailed Breitbart News the following statements — the second statement came after Breitbart News followed up to point out the first did not directly answer many of the questions asked. In all of our classes we always try to take a balanced, unbiased look at anything we are studying. Teachers make every possible attempt in our practice to push kids to think critically, look at multiple perspectives, and weigh all opinions around an issue or topic. We have had opportunities in the past to have leaders from both sides of the aisle come into school. There have been social studies classes (government, economics) that have welcomed in guest speakers from both sides to give kids a balanced perspective on a particular issue or topic. During the Blumenthal visit several of the students expressed frustration with progress under politicians from both sides – support for Veterans, tax breaks for companies hiring people with certain Visas rather than citizens, frustration and disbelief that current politicians can make forward progress in a bipartisan way. 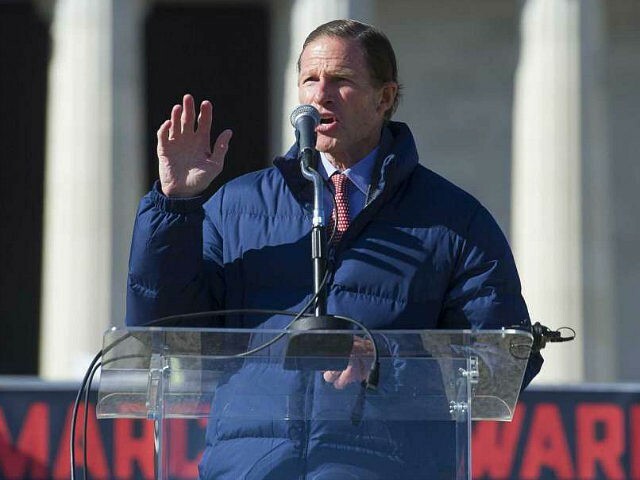 Blumenthal also criticized Trump for his efforts to stop thousands of migrants from Central America and elsewhere who are headed through Mexico to the U.S. border. He also claimed Trump was separating families, although those separations are required by U.S. law and have been in place for years. The students who attended the event came from classes in human rights, a global studies seminar, and a student equity team at the high school. Social studies teacher Jake Skrzypiec said that these classes seek to empower students to be informed citizens and participants in difficult, nuanced discussions about morality, ethics, and sometimes even heavier topics such as genocide. “It’s important they hear from a representative — a senator — who will give some meaning to their voices,” Skrzypiec said.